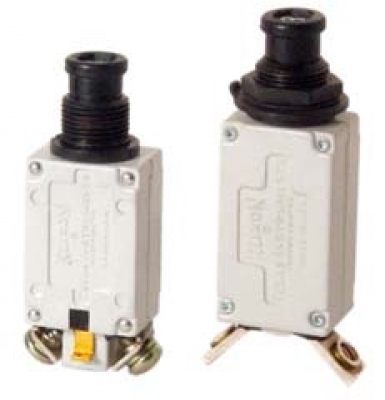 The Klixon® 7274 & 7277 series are small, lightweight, low amperage devices that are specifically designed to protect aircraft / aerospace cable and components in airborne vehicles and equipment. The 7274/7277 series are small, light weight, low amperage devices that are specically designed to protect aircraft / aerospace cable such as at ribbon, fused multi-conductor tape and printed circuit conductors now being used in lighter weight power distribution systems and components in airborne vehicles and equipment. The 7274 series features a tripfree indicating-type reset button. Also, a “wiping action” contact design assures low voltage drop, faster trip time and high reliability in low voltage applications. They are available in standard ratings from 0.5 to 20 amps.